The Republicans have built an uneven playing field of morality. Sure, don’t stoop to their level. But let’s acknowledge that the game Republicans are forcing everyone to play insists morality is for losers. 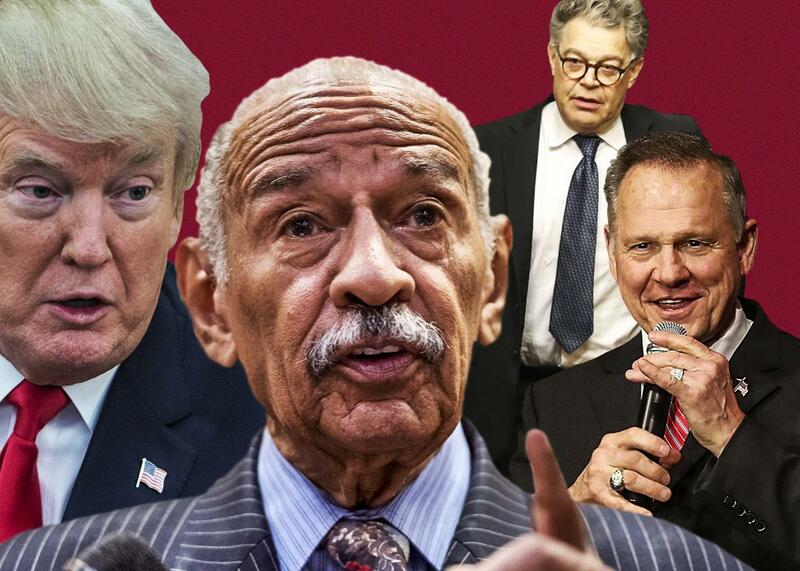 Under unilateral disarmament, Trump stays, Conyers goes, Moore stays, Franken goes. Photo illustration by Natalie Matthews-Ramo. Photos by Chris Kleponis/Pool/Getty Images, Saul Loeb/AFP/Getty Images, Mark Wilson/Getty Images, and Joe Raedle/Getty Images. Remember “when they go low, we go high?” Yep. So do I.
I remembered it in the fall of 2016, when Senate Republicans and then-candidate Donald Trump first made it irrevocably clear there would be no hearing for anyone Barack Obama nominated to the Supreme Court, ever, even though Obama had put up a moderate, centrist nominee who was once acceptable to Senate Republicans. I remembered it when Trump won, and we realized that that seat would stay stolen. I remembered it this week when the Senate passed a tax bill at 2 a.m. that apparently contains a $289 billion error, thanks to the fact that it was drafted in the margins rather than adjudicated through normal congressional standards, as, say, Obamacare was. And I remember it almost daily now, as John Conyers steps down after 52 years in Congress, amid credible allegations of sexual harassment, and Al Franken is called upon to step down, amid credible allegations of sexual harassment, while Roy Moore continues—with the president’s and the GOP’s overt endorsement—his run for Senate amid credible allegations of sexual abuse of children. Al Franken, many argue, should now resign. He should resign immediately because there are credible accusers (another emerged Wednesday), and because the behavior alleged is sufficiently abhorrent that there is simply no basis to defend him. In this parade of unilateral disarmament, Trump stays, Conyers goes, Moore stays, Franken goes. Sexual predation is bad and grotesque and disqualifying for national office and positions of power. Stipulated. Victim-shaming and claiming that “the people should decide” is contemptible avoidance of responsibility. But the question that remains is whether the analysis stops right there. I, too, would like to live in a world where the debate begins and ends with that proposition. But I don’t think any of us live in that world anymore. And this may not be the moment in which to try to resurrect it. You can talk about gradations of harm—what Franken is accused of still pales next to child predation—but even that is a trap. The point is, as Jennifer Rubin notes Tuesday, that “one party has adopted a zero-tolerance position (with Sen. Al Franken, Democrat of Minnesota, set to go before the ethics committee) and another party opens its arms to people it believes are miscreants.” Rubin feels confident that becoming the party of alleged sexual abusers will harm the GOP in upcoming elections (did she live through last November?). My own larger concern is that becoming the party of high morality will allow Democrats to live with themselves but that the party is also self-neutering in the face of unprecedented threats, in part to do the right thing and in part to take ammunition away from the right—a maneuver that never seems to work out these days. When Al Franken, who has been a champion for women’s rights in his tenure in the Senate, leaves, what rushes in to fill the space may well be a true feminist. But it may also be another Roy Moore. And there is something deeply naïve, in a game of asymmetrical warfare, and in a moment of unparalleled public misogyny, in assuming that the feminist gets the seat before it happens. This isn’t a call to become tolerant of awful behavior. It is a call for understanding that Democrats honored the blue slip, and Republicans didn’t. Democrats had hearings over the Affordable Care Act; Republicans had none over the tax bill. Democrats decry predators in the media; Republicans give them their own networks. And what do Democrats have to show for it? There is something almost eerily self-regarding in the notion that the only thing that matters is what Democrats do, without considering what the systemic consequences are for everyone. We are at a moment in this country in which entire institutions that existed to protect women—from the courts, to our criminal statutes, to our workplace protections—have proved not only incapable of protecting us but also to be tools used to shame and silence us. The question we now face is really about which institutions need to be blown apart altogether and recreated to promote justice, and which institutions do not or cannot. The Senate, I would submit, is not about to be blown up and created anew, with greater institutional solicitude for women. Not now. And that means that when it comes to the Senate, we play by the institutional rules and norms as they exist, even as those rules and norms devolve into empty shells. The alternative is a game of righteous ball, in which the object is pride and purity, and Dems are the only ones playing. In the event that you doubt that the war is asymmetric, ask yourself how long it took for the same GOP that was disavowing Moore a month ago to embrace him, and to embrace him again in the face of new evidence. Ask how long it took from when Trump made it clear that he would wage war on Robert Mueller for Hugh Hewitt—purporting to speak on behalf of “a large swath of responsible center-right observers”—to call for an investigation into Mueller. This because a former FBI official sent pro-Hillary texts that now raise, according to Hewitt, “the possibility of shattering public confidence in a number of long-held assumptions about the criminal-justice system generally and the FBI and the Justice Department specifically.” The president just claimed the FBI is “in tatters,” but it’s the former official, who Mueller pulled off the investigation for the texts, who shatters confidence in the agency? Who knows why the GOP has lost its last ethical moorings? But this is a perfectly transactional moment in governance, and what we get in exchange for being good and moral right now is nothing. I’m not saying we should hit pause on #MeToo, or direct any less fury at sexual predators in their every manifestation. But we should understand that while we know that our good faith and reasonableness are virtues, we currently live in a world where it’s also a handicap. Unilateral disarmament is tantamount to arming the other side. That may be a trade worth making in some cases. But it’s worth at least acknowledging that this is the current calculus. It’s no longer that when they go low, we get to go high. They are permanently living underground. How long can we afford to keep living in the clouds?